I love the thrill of fishing weed lines for bass. 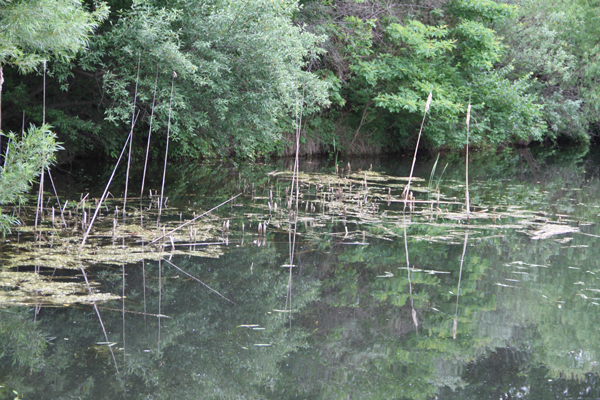 That exciting feeling of knowing that at any moment the water will erupt as a fish explodes through a carpet of vegetation to inhale my bait is truly one of the sheer joys of early summer. Last Saturday, I was at my favorite pond doing this very activity. It is not uncommon to see fish moving through the vegetation as they seek something to snack on. I had been noticing this type of activity and began casting a Zoom Super Fluke in a Bluegill Flash color. True to form, I quickly had a vicious hit but it was short of the bait and didn't take it into it's mouth. I fired back into the area only a little further in so as to work the Fluke up to where the hit had occurred. Again, another vicious hit but this time the Leviathan came out of the water after the bait. Somehow it didn't get the hook for the second straight time. The weed line grew out over a little deeper water, so I cast about five yards to the deeper side, making it come get the lure in a little deeper water where the weed-line was beginning to thin. "Maybe, I will have a better chance at setting the hook out here," I thought to myself. Without hesitation, this critter began working it's way through the vegetation. You could see the movement and commotion as it knocked plants aside under the waters surface. I let the Fluke sit idle as it had the bait zeroed in. The fish began to make a wake as it drew closer. Finally, with my heart beating about a million times per second, it exploded on my bait. I set the hook to the feeling of fabulous weight. I just knew it was a giant!! As I began to fight with this thing, it felt odd, as if something wasn't quite right. I could feel the thrust of a fish from time to time but it felt heavy for the most part and rather rock-like. I had indeed hooked a giant. Problem was...it was a giant bullfrog! About 1-2 pounds to be exact. The legs were very large and rather edible. As I sat perplexed as to how I might get this animal off my hook, the diabolical side of me began to fester. My mind was seething with possibilities. I love to catch big bass using live-bait. Why not try it with a giant bullfrog? Bass like frogs. Yeah, that's a good idea. So back in the drink went the frog. I kept it close enough to the bank for me to see it. This pond is amazingly clear for Louisiana and you can see down about 3 feet with polarized sunglasses. The frog was trying desperately to stay down along the bottom. My job was to bounce it up so big girl could see it. It didn't take very long. After about a minute or two of bouncing the frog, a 4-5 pounder came in and crunched this frog. I knew I could not hook the fish, but just sat there amazed that any fish would have a go at this giant bullfrog. She quickly let go and did not return. 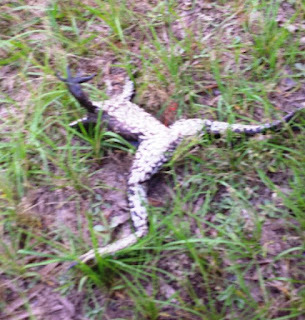 I pulled the frog out. Bless his heart, he was tired by now. Somewhere in the distance, the sound of "Taps" could be heard. I gently unhooked him and said a nice prayer over him. He sat there huffing and puffing. Then without any provocation, he rolled over and launched himself about 4 feet back into the weed-line and is likely eating some other enormous meal today. The Point of the story is to fish weed-lines. You have no idea what you will catch but there will not be a dull moment. If you have ever duplicated this and would like to share your story, go to our Facebook Page and leave a post and a pic there! No frogs were seriously injured during the filming of this article! Every now and then a truly new concept comes along. 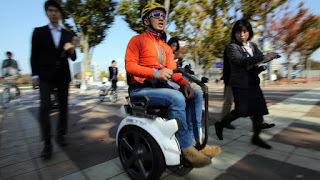 I saw this thing called an Ogo on Facebook and immediately became interested in writing about it. 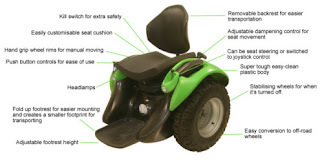 It's a new envisioning of the older electric wheelchair. I reached out to the Ogo's designer, Mr. Kevin Halsall. This was no ordinary interview. Kevin resides in New Zealand, while I am in Louisiana in the U.S.A., but thanks to modern technology, the internet and Skype, it was as easy as making a phone call. The Ogo is Kevin's baby. He began dreaming of something for his friend, Marcus, who is a paraplegic. The chair starts with a base that is actually the popular stand up vehicle the Segway. 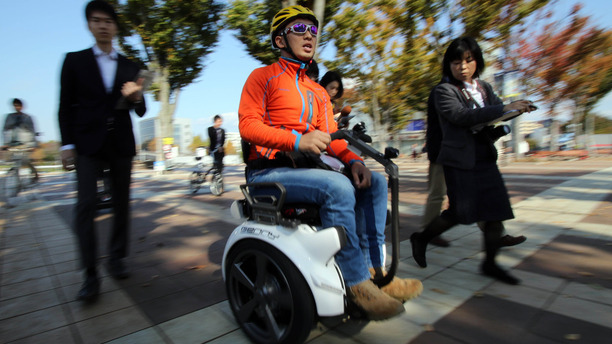 That's right, a 2-wheeled self balancing machine is going to support a disabled human that typically needs 4 wheels. Right from the start, I liked Kevin's attitude and vision. The Segway is an excellent choice as it is tough and is itself an entire rethink of how mechanized things should operate. It's two wheeled, which immediately gives it a smaller foot-print and is surprisingly off-road capable. The biggest change from normal is that it is controlled hands free. The person controls the chair with weight just like the Segway which gives the operator much more normal movement and freedom. It can go off-road by adding thicker tires which can be purchased additionally. It has a weight of 143 pounds which is much lighter than any other electric chair and especially those that can go where the black-top ends. The only draw back is that with the off-road tires, it is not A.D.A. accessible. With the regular width tires, it is and can comfortably fit through any accessible doorway or ramp. It can handle a 30 degree slope just like the Segway and has a max speed of about 12 mph depending on the surface being conquered and the weight of the operator. Kevin built the Ogo stage by stage as he could afford it, having his buddy Marcus testing it the entire way to failure which is important for you and I. Kevin was honest and said he has been surprised at how many types of disabled people can operate the Ogo comfortably. Are modifications available? 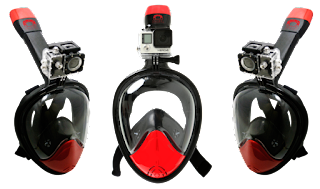 The Ogo can be customized rather easily to accommodate a much wider range of operators. Seat adjustments can be made to fit your specific needs by request. I asked Kevin how many investors have attempted to jump on the Ogo wagon. He said there have been many and that he has been leery of allowing any of them to join this new concept. He prefers to keep it organic with people like you and me. His goal is to keep the cost as low as possible for everyone. Starting price tag is $13,000 at present and Kevin is hoping for the Ogo to be released to the public by early 2017. One of the greatest things anyone can do on the planet is to snorkel in places like Key Largo, Cozumel or anywhere else the water is crystal clear. In certain months, the Florida pan-handle can even be a great destination and we aren't even touching on a number of lakes in the United States that are also awesome snorkeling destinations. For disabled and handicapped explorers, snorkeling can also be difficult and sometimes fearful. The mouth-piece must be kept in your mouth with lips firmly surrounding it making it difficult for some to enjoy this amazing water sport. Well, problem solved! Let me introduce to you a revolutionary mask that makes breathing a cinch for anyone. It's called the SNORKL. This mask is a game changer for anyone who has struggled with the traditional mask and mouthpiece. The outer gasket fits snugly to your entire face allowing you to breath normally inside the mask. On top of that, the patented way the air is brought into the mask and expelled, leaves the mask virtually fog free. One of the biggest problems to disabled snorkelers face is water getting into the tube. 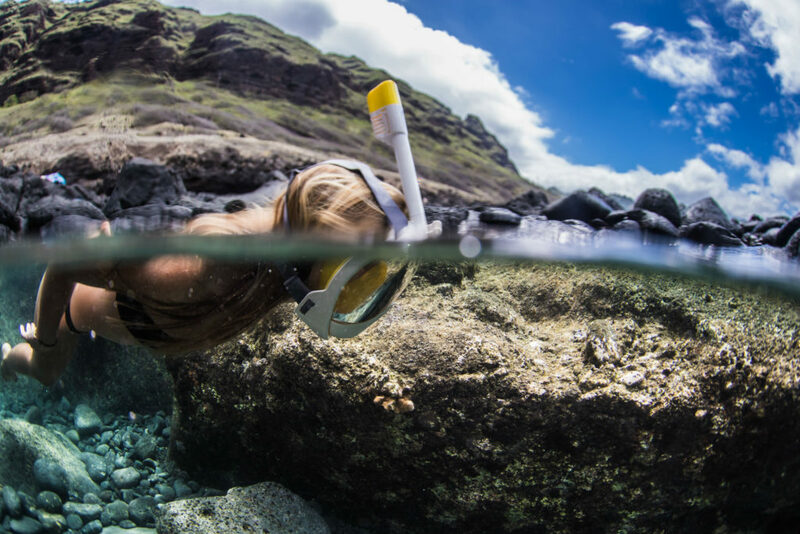 The SNORKL has another wonderful breakthrough by placing a floating ball system inside the tube that makes it impossible for water to enter the tube when you either dive down or accidentally go under the water line. As you come back and break the water's surface, the ball goes down and allows you to breathe freely again with no water in your mouth - AWESOME! 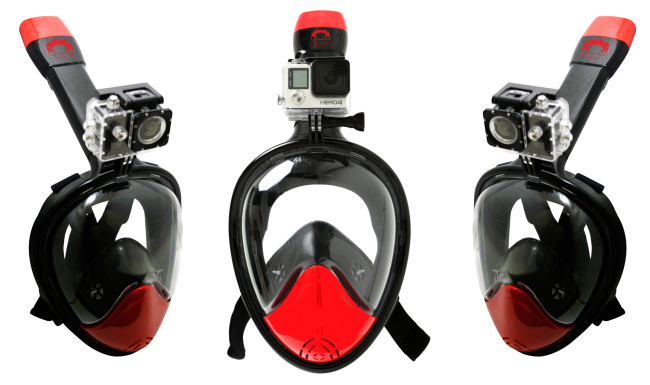 They even have a mask that a GoPro can mount to so you can record your adventures.